Just enquiring wether or not you do touch up paint for a motobike? Hi there! Yes we do work with motorbikes. Please enquire using our contact page – https://www.smartfinish.com.au/contact-us – for a quote. looking for an approx quote, son knocked over bike tonight while stationary. Scuff to the top right corner of fuel tank, where it appears to have taken the paint off. Small area to the side of my tank protector, approx 2cm by 4cm. Just looking for an approx of how much it would cost. Please remember to use our contact form to request a quote. Sometimes we miss the blog comments, the form is more reliable. I need to repair my car’s bumper and I have attached the pic of it. I need to know how much it will take for me to fix it. Just a reminder to use our contact form when you need a quote for your bumper repair or other vehicle repair. G’day, do you do cracking in tail light lenses? 1./ If you mean the tail light has got a crack all the way through it (i.e. broken), then no, we can’t repair it. We can sometimes arrange a replacement for tail lights, although we normally only do this as part of a larger bumper repair. 2./ If you mean some slight cosmetic cracking across the surface, we might be able to help. If you need more help, just send us a photo via the website contact form and we can make a better assessment. 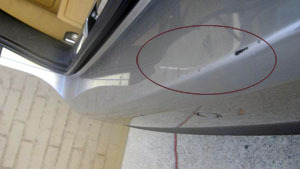 Thanks for your enquiry for paint repairs. Sorry for the delayed response. We don’t normally get quotes via the comments form, so we didn’t see this. Hopefully you’ve already got a quote from us via our contact form. If not, that’s the way to go. Have a great day!